Roger Federer likes his chances of winning the US Open after a resurgent run to the Wimbledon final and aggressive play that produced a tuneup title last week at Cincinnati. But the 34-year-old Swiss star, winner of a record 17 Grand Slam singles titles but none since Wimbledon in 2012, isn't looking past his first opponent when the Flushing Meadows fortnight opens Monday. "I feel like I have a good chance but I really can't think further than my first-round opponent right now," Federer said Saturday. "My focus needs to be not trying to win the tournament right away. That would be thinking too far ahead. I haven't been in the finals in this tournament as of late. I came close but close is not good enough. I’ve tried to build up as we move forward." Federer won five consecutive US Opens from 2004-2008 and reached the 2009 final, losing to Argentina's Juan Martin del Potro in a five-set battle. Since then he has reached every other major final at least once but not in New York. His immediate concern is 33rd-ranked Leonardo Mayer, his first-match foe from Argentina. Federer was surprised to find Mayer had not been seeded. Finding him across the net in match one was one reason Federer saw his draw as especially tough, with Czech sixth seed Tomas Berdych a possible quarter-final rival and either British third seed Andy Murray or French Open winner Stan Wawrinka potentially waiting in the semi-finals. "I didn't know he was unseeded. Total shock for me to see I was going to play him, because he’s been seeded for some time now at majors. All of a sudden he’s not seeded here, so that’s why I think he’s a really tough draw," Federer said. "I'm really just focused on the first round. It's really tough to be playing Leonardo Mayer so I have to come back to reality after the good week I had last week and go from there." 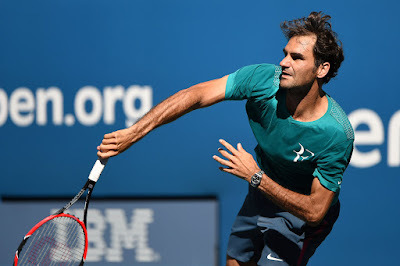 Federer won their only prior meeting 7-5, 3-6, 7-6(7) in the second round of the Shanghai ATP Masters event last year. "The Shanghai match was one of the luckiest matches I’ve ever won in my career to be quite honest. In Shanghai, and even now, the other day when I practised with him, I know the power he has, on both sides, plus the serve, as well. It makes him tough to control from the baseline. "I think I always have to try to make it an athletic match and there’s lots of movement, shortening the points, on my terms. I think he’s a challenge, to be honest. I hope I can play with my confidence and use my experience against a player like this." Federer would not commit to the same attacking style he used against Novak Djokovic and Murray at Cincinnati, but holds it out as an option. "As the tournament went on I kept up the aggressive play. I'm glad it ended well. We'll see if I do it here as well," Federer said. "It's not that important for me to keep the points short. I feel very comfortable rallying. I've done that for 10 years. I can be very creative and I think it's important for me to use that." Federer has won titles this year at Brisbane, Dubai, Istanbul, Halle and Cincinnati. At Wimbledon, he ripped Murray in straight sets in the semi-finals but lost in four sets to Djokovic in the final. "Maybe looking back at Wimbledon I peaked too early against Murray, then didn't quite play as good as I did against Murray against Djokovic," Federer said. "Still, Novak causes different problems than Murray does, so maybe it's also matchups. I try to save the best for last. "My game is going very well. My volleying has been very good lately and very proactive going forward and I think my serve has been unbelievable lately. It's clearly very important that keeps working because it's the base of all things. My game is usually great when I move well, which I did in Cincinnati. That's very good going into the Open."